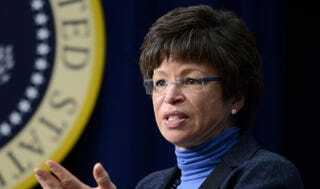 When It Comes to Race, Valerie Jarrett Asks Why It’s All on the President. But Why Not? On Wednesday, President Barack Obama's top adviser Valerie Jarrett did a 30-minute interview with Walter Isaacson at the Aspen Institute. Isaacson asked Jarrett about Obama's reticence on race. "Some of us feel there was an opportunity throughout this presidency to really deal passionately, vocally and without putting a muffled hand in front of the face on the issue of race. The president only did it halfway. He was always holding back on that. You've got 18 months. Is this going to be the passion of the final stretch?” Isaacson asked Jarrett. "I think you have to ask yourself: Why is that all on him? Why is that his responsibility?" said Jarrett, adding, "Each of us have to have that conversation," and "The question is what are we gonna do? Let's take the burden off of him solely … because this is a collective responsibility … this has to happen family by family and at the watercooler …"
One thing's for sure: It's a good thing Jarrett wasn't a senior adviser to Abraham Lincoln or Lyndon Johnson. It's notable that Jarrett, who engineered the vibrant display of rainbow colors on the White House after the Supreme Court ruled last week in favor of a right to gay marriage, doesn't use the same template of logic for issues of race that's used on LGBT and Hispanic policy concerns. Why Jarrett didn't simply cite Obamacare that's been blocked by Republican governors in the South, and a record number of black judicial appointments, and move on is anyone's guess. When it comes to issues concerning minority groups, whether Hispanics, blacks or LGBT people, waiting for that "collective" nirvanalike moment, as if we "all" have control over the universe, would mean nothing would ever change. Whether it's women's rights or civil rights, change arrived when the law exacted a penalty for discrimination, making it costly. For six years, there's been a haze of powerlessness when Team Obama's folks are asked about race. But just as sure as there's no point in waiting until "we all work on" issues like gay marriage or immigration reform, there should be no waiting on the black agenda, either. Particularly when so many black issues deal with institutional bias regulated by the government, as in the cases of lending and housing. Imagine what the rapid response would be from LGBT advocates if Jarrett said, "Why is that all on him and why is that his responsibility?" when speaking on gay marriage. Of course, that response is unthinkable. It's not "all of our problem" that gay people were not being treated equally under the law when attempting to obtain a marriage license. For President Obama, there's now no need to explain what's been fought for regarding gay rights and immigration reform because the president has strongly taken up those concerns and fought for them at every turn. Concern on those issues is viewed through specific policy, not as something that can only be fixed by collective mindset. That's why the Obama administration announced in 2011 that it would stop defending the anti-gay marriage Defense of Marriage Act. That's how the executive order that immigration advocates wanted in June 2012, Deferred Action for Childhood Arrivals, happened. Was there high political drama after those decisions and red-hot pushback lawsuits from the right? Yes. What else is new? President Obama pushed forward. In July 2014, Obama asked for a $3.7 billion emergency appropriation for immigrants entering Texas before immigration advocates even started to push hard. Meanwhile, in black-agenda land, whether it's black unemployment (it's always been high, so whatever … ), police brutality (that's a state issue … ), HBCUs (we can't change Parent PLUS loans back to the way they were … ), Detroit (they must work with creditors … ) or blacks targeted by banks for subprime loans, we're told that black issues can't ever be directly confronted. There's always some mystical reason or another—even when racism is the reason for the problem. As the stats for black America come in with 18 months left in his presidency—28 percent of blacks in poverty, a record gap in wealth between black and white, and a black unemployment rate with an average higher than during President George W. Bush's eight years—we see that the way black issues are dealt with has consequences and that a "rising tide" does not lift all boats. Obama is now playing a game of catch-up on the issue of race, but he's speaking much more forcefully than ever before. But will there be policy to mirror his strong sentiments? After a brilliant eulogy at the funeral of South Carolina state Sen. Clementa Pinckney last week, there is hard policy to consider.